Max Limpag shows that if you can eat lechon, you can run. And just like that, I just woke up one day to see that my little island home province is now a place of running crazies. Stop Smoking, Start Running. Photo from ceburunning.com. Then a reaffirmation came from Haide Acuna with her battle cry, “I run because I won’t give up my humba.” (Haide is entirely a different story too.) 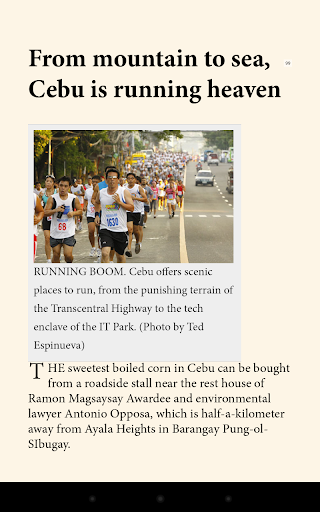 Then off Cebuanos consume running like it’s their typical Sunday lunch of lechon or humba. *We have 1 or 2 or even more running events every weekend. * We have the biggest number of participants among all the different Milo provincial legs. * And even races outside Cebu, you would not miss to see a Cebuano, probably wearing a shirt with that “smiley” face — UNGO Runners. * Can we also include that Cebu hosts 2 international triathlon events, Exterra and Cobra Ironman 70.3? And, not to mention the many in-between tri events like Tabuelan 111. Is there any province in Philippines that have these? * Can I also add that Cebu is home to one of the best finisher’s medal maker, Suarez Brothers, for being mentioned in BaldRunner’s post. * If the above facts are not enough to prove that indeed Cebu is becoming a home of running crazies, wait until you will learn that Cebu province hosts the most number of ultra marathon races (races beyond 42KM) based on The Scientist Runner’s Philippine list of ultra marathon races in the Philippines. Not to mention that Cebu is the first to organize an all-women ultra race in the whole wide world. For a small island of less than 500KM circumference distance, it can be a puzzling thought as to how it could keep up with 9 ultra marathons and 3 marathons in a year on top of not less than 2 fun runs every weekend, and not to forget the triathlon events. Somehow Max Limpag is to be blamed for this. Max repackaged running into something less serious, fun, and gave it a mass-market appeal. We used to look at running as a very serious activity. It has this aura of intimidation that only members of executive exclusive clubs like Cebu Executive Runners Club can only do. But then came Max, together with his wife Marlen and the support of their Sun-Star colleagues, they created UNGO Runners Club. I guess everyone will agree that UNGO is the grandfather of the running clubs in Cebu. Most of the running clubs’ roots can be traced back to UNGO. There is also the celebrity running couple, Dr. Yong and Donna Larrazabal, who did not fail to grab the attention of us, showbiz-lover, to running. But with their sub-2 hours 21KM running time, I guess, most of Cebuanos can just remain star-struck at this couple. But with UNGO’s FNR (Friday Night Run), which started as Max and Marlen’s date run where third-wheels are welcomed, people could not resist to get out and join in the no-brainer kind of running. It then created a lot of disciples and a running religion was built in Cebu. Max and Marlen Limpag had not only help spread the running virus, but also injected a “warm friendly” culture in Cebu’s running community in which runners on the front to the back are all cheered on. But where is Max Limpag now? Though his running spirit and cult is very alive in Cebu, and even outside Cebu, we (or more of I) can hardly find him on the road racing or running. According to him, he is still running. But he is currently engaged in a different race, his new media startup called InnoPub (Innovative Publication). Just as how he de-mystified running to the masses, Max Limpag is on the challenge of becoming a Jeff Bezos (Amazon) of the new media in Philippines. While Bezos is known for introducing the online bookstore, Amazon, a new way of selling and buying books then later on expand to all kinds of products, Max is introducing a new way of producing and consuming content via consumer gadgets on the local arena. He is currently trailblazing projects: producing electronic guidebooks on Cebu, data-tagging of tourism and heritage sites with QR or quick response codes (phrase borrowed from his InnoPub About page). With the powerful devices more accessible to the mass market, creating valuable content and making it available to the consumers almost costs nothing except time and creativity. Just like in running, Max wants to advocate that we don’t need to be CNN or ABS-CBN to become a media company. And, so there is Max Limpag. He is currently in a multi-stage, multi-day race of innovating publication! More about InnoPub, check InnoPub.com, and MyCebu.ph, where you can download guides and other contents for your e-readers. Here are my copies (but not the gadgets)! Now, show me what you got! For more stories, please LIKE us at facebook.com/runroo, or connect with us at twitter.com/gorunroo. Our race calendar app, aktib.ph, is now on beta, kindly check it and give us feedback. You can create your race calendar from there. It’s still in its infancy stage, so kindly bear with it for now.